It’s a truism that you work harder on your holidays than you do in real-life work, which explains why the clerk on reception was ringing us at 4am with a cheery hello. The balloon ride we’d booked on was the lure to drag ourselves out of bed at this ungodly hour, nearly two hours before sunrise. After coffee in the ship’s bar and a ferry ride in the dark across the Nile to the West Bank of Luxor (quick Egyptology lesson for you: east bank, sunrise, life, temples. West back, sun sets, death, tombs) we got to the balloon launching site, right beside the Ramesseum, one of the main sites in Luxor, which we’d managed to miss completely in our three days in the area. 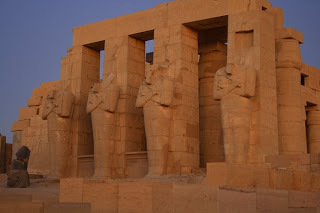 So instead of standing around watching around 20 ground crew get seven balloons up and running, we nicked off to photograph the Ramses II vanities – the pharoah in a god-like formation, once around 18m high, now the four are headless as time and earthquakes have taken their toll. 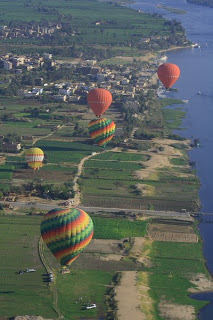 We finally got into the last balloon of the morning, a struggle as the wind changed constantly, but ended up taking us across the Nile, a rarity that delighted our pilot. Before us were perhaps a dozen balloons that drifted serenely across the straight-lined canals that run alongside the Nile, skimming mosques’ minarets, past a school that we played havoc with, as every child and their teachers hung out the window in a frenzy of ‘hellos’ to land gently in a field of sugar cane. The owner of the fields came to greet us on this rare occasion, and welcomed us to his land, even though we had squished some of his young plants. Small boys mobbed us with demands of ‘money’ and ‘baksheesh’ but the consensus was that it would be the pitifully paid ground crew, not the jammy kids, who would get any spare change. 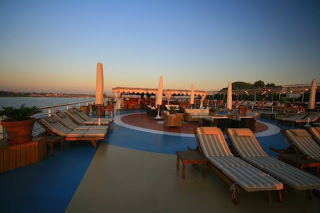 The afternoon saw us back on the Antares, snoozing and lolling on the sun deck. Brigid delights in the old-fashioned sailor suits, though she laments the straight-leg trousers they wear. 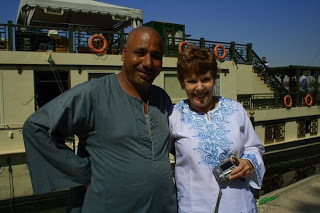 “Where are the bell-bottoms?” she wails, debating how they could possibly scrub decks in skinny leg jeans, and during dinner last night, we passed through Esna Lock, the key control on the Nile. Last night, we jumped ship to another vessel, the MV Antares, reportedly one of the best boats on the Nile, rivalling the Zara, which staff say just has a better marketing budget. It is divine. 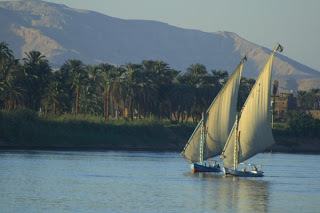 We will spend four nights sailing Luxor to Aswan, which takes just three hours by road. 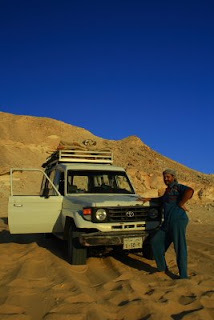 The areas around here are quite tightly controlled by police in response to terrorist attacks in the past 10 years, so today, after we sailed up to Qena to visit Dendara, the most spectacular temple yet, we were met by Wa’el, our lacklustre guide, in a brand new, super-red private car with driver. We jumped in the car, a police van with two smiling cops in the back brandishing guns pulled in front of us, and when we looked behind, saw about four tour buses and a horde of minivans full of tourists following behind as we led the convoy to Dendare and Abydos, the other major site near Qena. At all the road blocks through the town (and there were many), the police grinned and waved. May all my future police escorts be so cheerful. 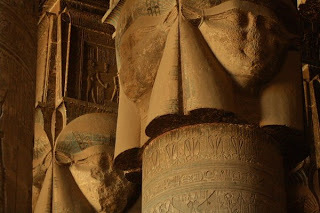 This temple, dedicated to the goddess Hathor, is my favourite hysterical site in Egypt. It is just beautiful and beautifully preserved. 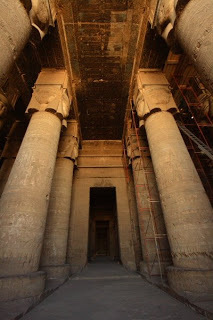 There is a restoration program currently ongoing to clean all the soot from the high ceilings – a legacy of the cooking fires of the Christians who romped into Egypt and lived in the by now abandoned temples from 90AD (give or take a few decades). Beneath the soot are the original colours of the painted carvings, which cover the stone walls from top to bottom – the azure blue sky up above, the signs of the zodiac and the long eyes and long hair of the beautiful goddess herself. Most of her faces, and there are many in the temple, have been hatefully gouged out. The guidebooks blame the Christians, our Christian guide says that’s just a negative marketing campaign against his religion. Luxor, land of temples and tombs, is completely at ease with its tourist population…as long as the tourists buy their dodgy necklaces, suspect pashminas (um, from Peshwar? ), faux papyrus or, perhaps, a glow-in-the-dark phosphorus pharoah. If you were Pharonically obsessed, you could even buy a t-shirt (Egyptian cotton, of course), screenprinted with a pic of your face superimposed on a pharoah’s head dress. 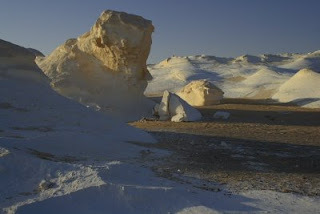 The city sits on the east bank of the Nile, where the Karnak and Luxor temples still stand, 2km apart, once linked by the Sphinx-lined road, the Valley of the Sphinx. 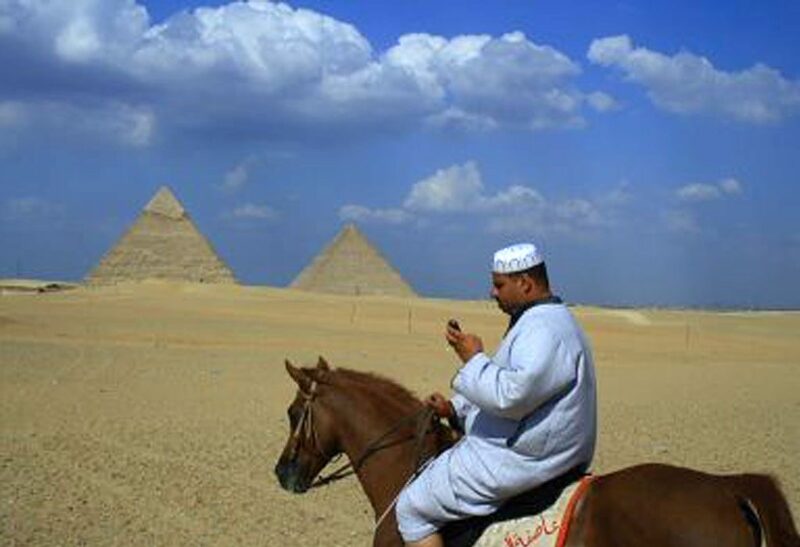 That royal route was interrupted by Egypt’s most recent Muslim population, who built their houses between the massive sculptures. Most was cleared off to preserve the ruins, though a 13th century mosque still sits in between the two. For two nights, we slept on the Dahabiya Hadeel, a new riverboat modelled on the elegant boats of the 1920-40s, with its wicker chairs, shady canopies and (very un-1920s) jacuzzi on the deck. 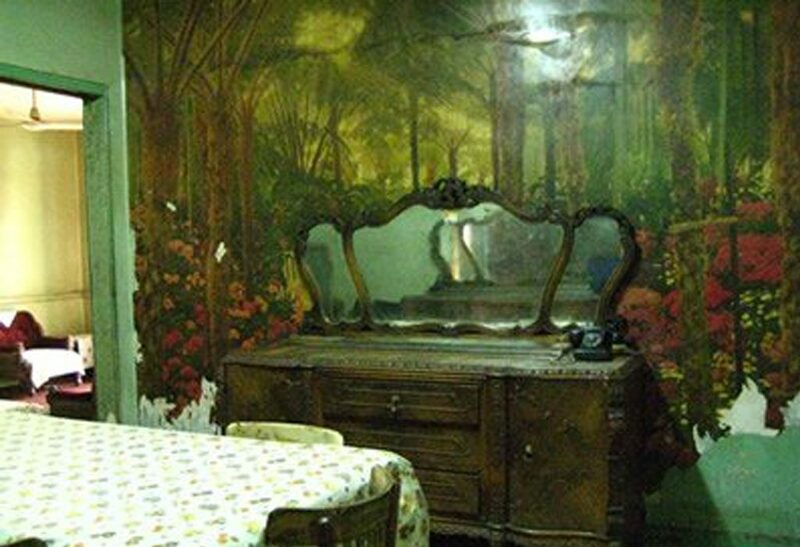 The captian, Mustafa, prowled the decks in his sea-green gallibiya, asked mum if she’d consider being wife no. 2 (the current one has seven kids so it’s all a bit of a handful). Mother says no, but they’re quite a fetching pair. 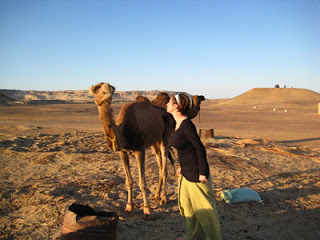 The first day was spent in the Valley of the Kings, and can I say…I was disappointed? Spare me from the hate mail, but the combination of bad guiding, hot day and incessant rushing (if you spend thousands of dollars getting here, why do they rush you?) made for a less than impressive experience. There. I’ve said it. Of course we missed the train to Luxor. Blame it on the rain. It rains in Cairo around six times a year – just enough to settle the dust and not enough to warrant bringing everything in off the roofs or balconies, which are the city’s junk and rubbish repositories. The train was there, we could smell it, taste it, but alas, not touch it, falling in a heap of bags and backpacks seconds after its departure, to be picked up by Ibrahim, the same super-schmoozy tourist policeman who had helped me buy my ticket a few days before. So imagine his delight in scraping me, mum and our junk off the floor, to give me a dressing down. “What did I tell you about arriving half an hour beforehand?” he asked. “The rain, the rain!” we protested. He shook his head, but after an hour of idle chat, some string-pulling and promises of everlasting, non-marrying friendship, scored us the last two seats on the 12.30am train. Which is why now, at 9am, we’re having our third cup of tea and watching the harvest from our seats as we trundle slowly toward Luxor and a week on the Nile. ‘Begoon,’ it reads on the menu. I’m getting pretty good at menus, but this one has me stuffed. And stuffed it is. 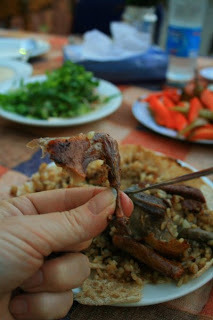 Begoon is the Arabgleeze for ‘pigeon’. (is there a word for Arabic-English, like Spanglish? Let’s make one up!) Yes, the flying rat. 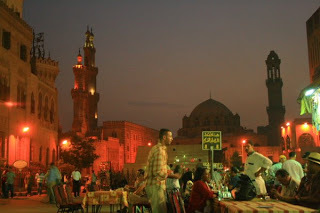 So I order the begoon, sitting in the most touristy midan or plaza, of Cairo. I have taken up residence in the front seat of a café that faces the country’s most holy mosque, Al Hussein (died AD 680), the grandson of the Prophet Mohammad. Its holiness derives from the tomb inside, which is said to contain Hussein’s head. As we’re in sight of a mosque, there’s no beer (though they serve a non-alcoholic version, Birrell) and the square is packed with tour buses, tourists more touts than you can poke a sheesha pipe at. They’re selling shoe shining, Ko’rans translated into a Babel-like number of languages, tacky headdresses supposedly worn by belly dancers, cheap papyrus, leather wallets, fake watches…what do you want? One boy is carrying a standard wooden crate of flat bread on his head. If he can’t sell you the bread (and he’s pedalling to café patrons) he’ll sell you a photo opportunity of him with said picturesque bread on head. Some, like the woman with a sleeping baby, are just out-and-out begging. The begoon when it arrives, is a taut drum of well-cooked, oily skin containing rice and a few scraplets of meat on the tiny legs. The bones, of which there are many, go to a battalion of waiting cats beneath my chair, the scene of open warfare between a big-headed ginger tom and a black, malevolent creature that hovers just out of ankle’s reach. So what does pigeon taste like? Chicken. Of course. In the City of the Dead, Turkish generals sleep under marble slabs, while the children of their former subjects live, breathe, work and play above ground, alongside the tombs. 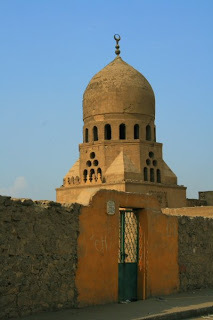 Some of Egypt’s most significant architecture is here, such as the Mosque of Sultan Qaitbey, its walls backing onto slums where flocks of goats and armies of bare-foot children run between the headstones. 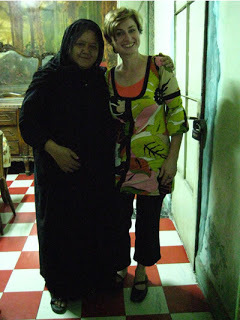 The City is just past the fringe of inner-city Cairo, on one of the rolling hills that lead up to endless suburbs of low-income concrete blocks, like those you would have seen in the news which collapsed a couple of months ago, killing 82 people. Despite it being a cemetery, the main road through it, a (mostly) one-way street, constantly roars with taxis, microbuses, donkeys, school buses. Cafes play the soaps on old tvs, men weld spare car parts together, cats scrounge through rubbish beneath elegant arches and women hang washing out in front of 15th-century mosques, when Egypt was controlled by Mamaluk warlords, then Turkish pashas, and witnessed the rise of of the Albanian mercenary Mohammad Ali. 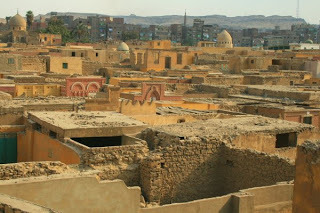 Tombstones erupt crazily from the dry earth, set in small courtyards with comfortable banquette seats around their walls, where Egyptian families come on Fridays to hang out with the departed, eating, drinking and letting the kids run riot in what the guide books say is a continuation of the Pharonic tradition of living with the dead. We stepped into one such courtyard, where the earth was wet and turned – a man had been buried there the day before, my impromptu guide told me: the dead city is still well and truly living.